"Suspensions Force Bishops to Reassess Rule Changes"/ Will Catholics Hold Rigali and the Vatican Accountable? ..."Cardinal Justin Rigali of Philadelphia at first rebutted the grand jury’s findings, then changed course, suspended three priests and ultimately suspended 21 more — the largest mass suspension by a diocese in the three-decade history of the abuse scandal. .. The real question Catholics must ask themselves at this latest shocking revelation that 37 priests who were accused of sexual abuse or misconduct remained in ministry in Philadelphia under the supervision of the Cardinal and the Review Board is about accountability. Now the Grand Jury is investigating and will hopefully get to the bottom of the facts in the case. But the bigger issue is a spiritual one and that is how can Catholics in the pews continue to support an institution that has betrayed them? Absolute power vested in a top down hierarchial system does not work.Have the people of God have enough of this corrupt system and criminal behavior?Isn't it time to hold the Cardinals, bishops and Vatican accountable? People of faith must take the next step, jump in and reform their church. We ,the people ,are the church, not the hierarchy alone. We cannot keep looking the other way, ignoring the elephant in our living rooms. Ask yourselves, what would Jesus do? Let's follow Jesus example of Gospel equality. He called women and men as disciples and equals. Now is the time for a renewed priestly ministry united with the people of God. Now is the time for Catholic communities to call forth women priests and married priests. Limiting the priesthood to celibate males is no longer viable or healthy. It is a disaster! Watch news story on RCWP in Canada. 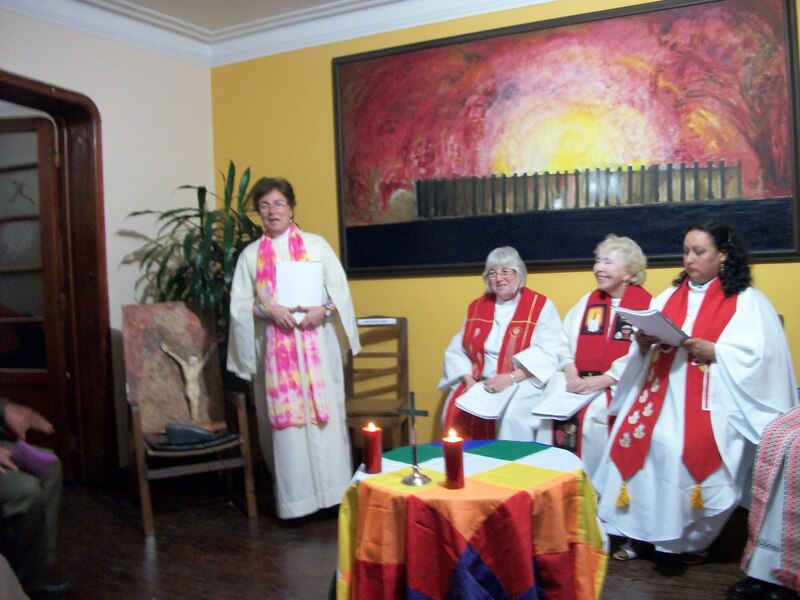 Woman Priest in Latin America. On March 20, 2011 Martha Lulita Soto was ordained by Bishop Bridget Mary Meehan. This historic ordination took place in an ecumenical center for justice and peace in a poor neighborhood where property was protected by high fences. When we entered the small rooms with old classroom chairs and wooden tables, it appeared to be a place like any other. We greeted the people assembled and formed a procession where neighborhood leaders, nuns, children, a Roman Catholic priest and a Presbyterian pastor joined us. Those gathered welcomed us with warmth, enthusiasm, and joyful anticipation of the history to be made. Then the director of the center, a priest, stepped forward to greet us and explain the artifacts in the room. The chairs are labeled with the names of people who became martyrs. The large painting behind our makeshift altar, covered with a cloth made by indigenous people, revealed haunting faces of “los desaparecidos,” the many women and men who were taken during a time of holocaust in “war zones” as farmers protected their land. The priest showed us a large rock that was used to murder those who resisted oppression and those who stood with them. Many nuns, priests, missionaries, and lay ministers were among them. He showed relics and shared stories of the modern day martyrs and saints. Silence and emotion encircled us as we realized that we were encompassed by a large cloud of witnesses who continue to support equality and justice for all. We were reminded of the statement from the Conference of Latin American Bishops held in Medellin, Colombia in 1968 that justice is a constitutive dimension of the Gospel: “The Christian quest for justice is a demand arising from biblical teaching…We have faith that our love for Christ and our brothers and sisters will not only be the great force liberating us from injustice and oppression, but also the inspiration for social justice, understood as a whole of life and as an impulse toward the integral growth of our countries." 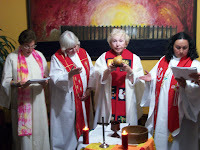 The Association of Roman Catholic Women Priests affirm this prophetic vision and dedicate our lives of service to justice for all, justice for the poor, and justice for women including women in the Roman Catholic Church, which mandates the ordination of women in a renewed priestly ministry united with the people we serve. Judy Lee, RCWP, program coordinator for Latin America, moved to tears, responded in Spanish that we were deeply grateful to share this holy space, and we join them in solidarity on this sacred ground. We will include these saints in our Litany of Saints in our ordinations. The priest responded that the issue of women in the church is a prime example of injustice, and expressed solidarity with women who are called to be priests. He needed to return his work and was not able to stay for the ordination. Another priest was with us. He is a prominent theologian and educator who, in fact, taught theology to our ordinand and other women present. He assisted us throughout the ceremony. Here, embraced by those who suffered and gave everything we stepped forward to ordain the second South American woman priest. 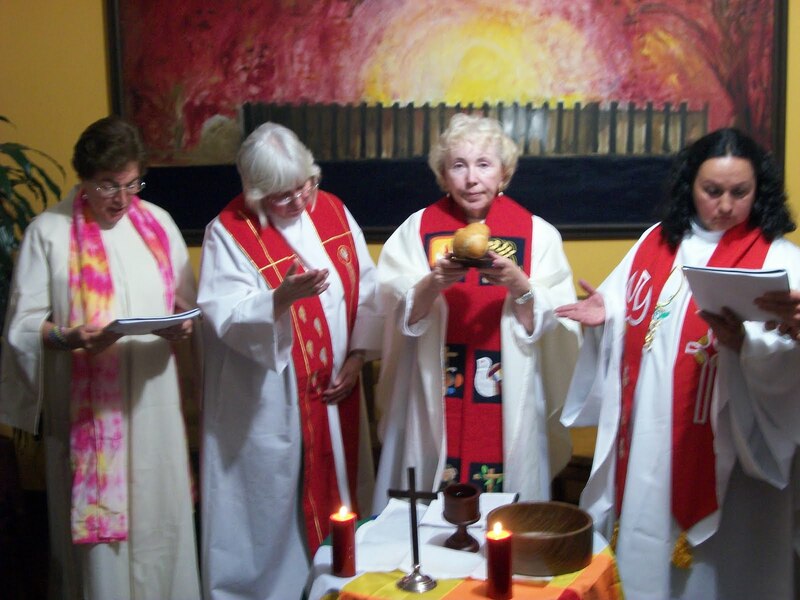 The first, Olga Alvarado, was ordained in December in Sarasota, Florida. Before the Liturgy of the Word, as Olga presented the reasons Martha should be ordained, all present nodded in assent and affirmation. Martha was surrounded by two of her adult children and many friends and supporters. After an impassioned homily delivered by Bridget Mary and translated by Olga, people were emotional, responding with tears and applause as Martha Lulita Soto was ordained. All present came forward to bless her with the laying on of hands. During the time of giving thanks for supporters, a pastor of a local Christian Church stepped forward, welcomed Martha into the ecumenical community, and strongly affirmed support for our women priests. Martha ended the time of giving thanks with a poem she wrote that speaks of realizing the dream of equality and justice through active resistance. After the final blessing given by Bridget Mary and Martha, all embraced, dancing with one another in compassion and solidarity. Later in the evening, we met with five applicants and their supporters. We were excited and moved to learn how their justice and compassion oriented ministries are in solidarity with the poor and outcast. We also noted that the theological preparation of these women was outstanding. The local Catholic University is progressive and there are many other learning opportunities available to our women. It was stated that a local archbishop answered a young woman’s question regarding ordination by saying that the ground is prepared and the acceptance of women’s ordination to the priesthood may take ten years but it will come in the young woman’s lifetime! The harvest is ready and the women are stepping forward as Roman Catholic Women Priests! Asamblea inmediatamente después de su ordenación. El 20 de Marzo de 2011 Marta Soto fue ordenada por Obispo Bridget Mary Meehan. Esta histórica ordenación se llevó a cabo en un centro ecuménico para justica y paz en un vecindario pobre donde la propiedad estaba protegida por altas cercas. Cuando entramos los pequeños salones con escritorios y sillas para estudiantes y mesas de madera, parecían ser un sitio como cualquier otro. Saludamos a las personas reunidas y formamos una procesión con los líderes del vecindario, monjas, niños, un sacerdote Católico Romano y un ministro Presbiteriano. Todos nos recibieron calurosamente, con entusiasmo y gozosa anticipación de la historia que se estaba forjando. El sacerdote director del centro se adelantó a saludarnos y a darnos una explicación sobre el salón. Las sillas tienen los nombres de personas que fueron mártires. La gran pintura detrás de nuestro altar improvisado, estaba cubierto con una tela tejida por los indígenas, que mostraba las caras de "los desaparecidos", los muchos hombres y mujeres que fueron llevados durante el tiempo del holocausto en las "zonas de guerras" cuando los campesinos protegían sus tierras. El sacerdote nos mostró una piedra grande que fue usada para asesinar a quienes resistían la opresión y a quienes se mantuvieron al su lado. Entre ellos hubo muchas religiosas, sacerdotes, misioneros y ministros laicos. Nos mostró reliquias y nos contó historias de estos mártires y santos modernos. El silencio y la emoción nos envolvieron al darnos cuenta de que estábamos rodeadas de una nube de testigos que continua apoyando igualdad y justicia para todos. Nos recordamos del pronunciamiento de la Conferencia de Obispos Latinoamericanos ocurrida en Medellín en 1968, que la justicia es una dimensión constitutiva del Evangelio. "La búsqueda Cristiana por la justicia es una demanda que emana de la enseñanza bíblica. Tenemos fe que nuestro amor por Cristo y sus hermanos y hermanas no solo será una fuerza liberadora de la justicia y opresión, sino que también será una inspiración para justicia social, entendida como una totalidad de vida y como un impulso hacia el crecimiento integral de nuestros países”. 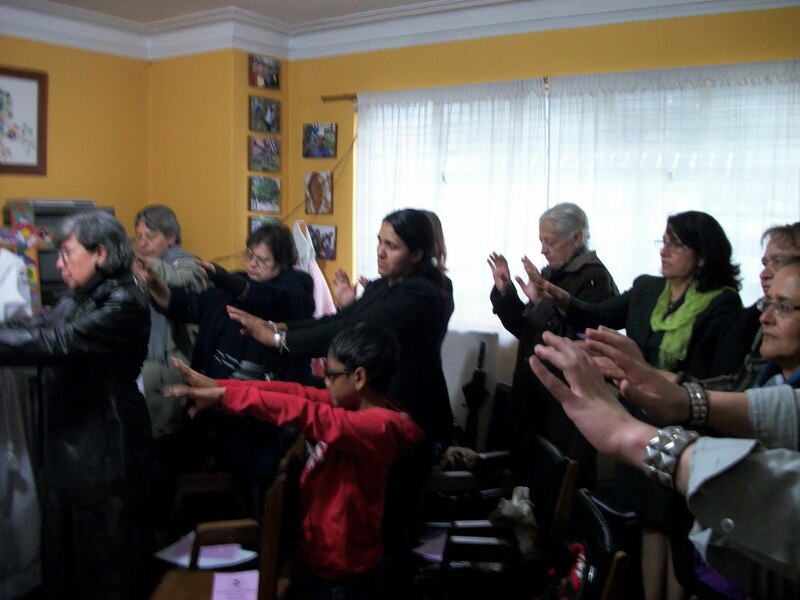 La Asociación de Mujeres sacerdotes Católicas Romanas afirma esta visión profética y dedicamos nuestras vidas al servicio de justicia para todos, y justicia para las mujeres, incluso las mujeres en la Iglesia Católica Romana, que manda la ordenación de mujeres en una renovación del ministerio sacerdotal, unidas a las personas que servimos. Judy Lee, Coordinadora del programa para Latinoamérica de RWCP, con lágrimas en los ojos, respondió en español que estábamos profundamente agradecidas de compartir este espacio sagrado y de unirnos en solidaridad en esta tierra sacrosanta. Incluiremos estos santos en nuestra Letanía de santos en nuestras ordenaciones. El sacerdote contestó que la exclusión de las mujeres del sacerdocio es un ejemplo de injusticia, y expresó su solidaridad con las mujeres llamadas al sacerdocio. Él tenía que volver a su trabajo y no pudo quedarse a la ordenación. Otro sacerdote que nos acompañó es un teólogo y educador de prominencia que enseñó teología a nuestra nueva presbítera y a otras de las mujeres presentes. El nos asistió durante toda la ceremonia. Aquí, abrazadas por aquellos que sufrieron y sacrificaron todo, proseguimos a ordenar la segunda mujer de Sur América. La primera, Olga Alvarado, fue ordenada en Diciembre 2010 en Sarasota, Florida. Antes de la Liturgia de la Palabra, cuando Olga presentó las razones por las que Martha debía ser ordenada, todos los presentes inclinaron la cabeza en asentimiento y afirmación. Marta estaba rodeada por dos de sus hijos adultos, muchos amigos y personas que la apoyan. Después de una homilía apasionada de Bridget Mary y traducida por Olga, las personas estaban emocionadas, respondiendo con lágrimas y aplauso a la ordenación de Martha Soto. Todos los presentes avanzaron a bendecirla y a ponerle sus manos. Al momento de dar las gracias por las personas que ofrecen apoyo, un pastor de una iglesia cristiana local avanzó a darle a Marta la bienvenida a la comunidad ecuménica, y expresó su apoyo por nuestras mujeres sacerdotes. Marta concluyó el momento de agradecimiento con un poema escrito por ella que habla de la realización del sueño de igualdad y justicia a través de la resistencia activa. Después de la bendición final dada por Bridget Mary y Martha todos nos abrazamos, danzando el uno con el otro en compasión y solidaridad. Mas tarde en la noche nos reunimos con cinco solicitantes y personas que las apoyan. Estábamos emocionadas y conmovidas de ver cómo sus ministerios orientados hacia justicia y compasión son solidarios con los pobres y los rechazados. La Universidad Católica local es progresista y hay muchas otras oportunidades para estudio disponibles para nuestras mujeres. Se dijo que un arzobispo local respondió a la pregunta de una joven sobre ordenación diciendo que el terreno esta preparado y la aceptación de la ordenación de mujeres puede demorar diez años pero va a ser una realidad durante la vida de esta joven. La cosecha esta lista y las mujeres están avanzando como Presbíteras Católicas Romanas.